Meshal Ali Alshahrani et al. 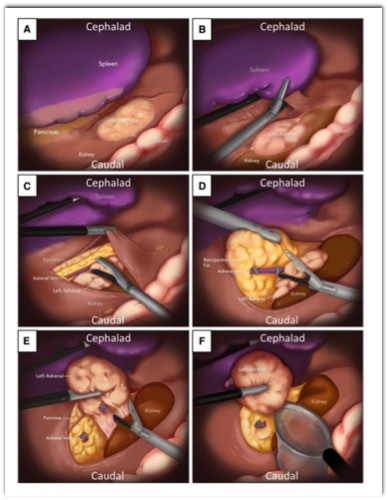 However, controversy persists as to the appropriateness of the laparoscopic approach under some circumstances, particularly for large adrenal tumors and for suspected ACC. 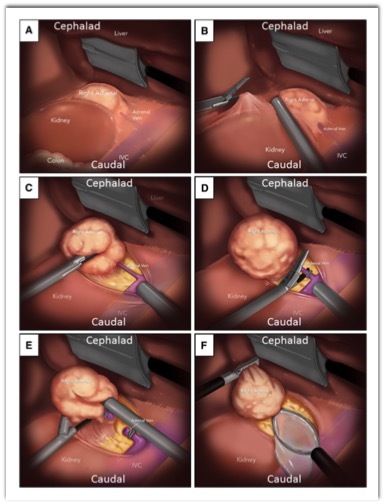 For ACC in particular, open adrenalectomy has been associated with improved oncologic outcomes, secondary to lower rates of intraoperative tumor capsule violation and to lower risk of tumor margin positivity, despite the more significant short-term morbidity inherent to this invasive technique (relative to its laparoscopic counterpart). Adrenalectomy is the standard of care when treatment is indicated for an adrenal tumor. 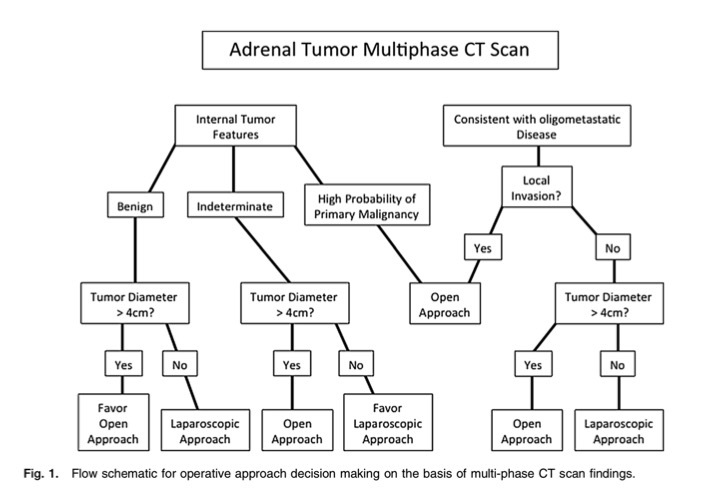 Though dissertation of the various modalities available for adrenal imaging is beyond the scope of this manuscript, assessment of imaging characteristics that inform selection of adrenalectomy operative approach is effectively achieved by multi-phase CT scanning (including tumor size, probability of malignant character, identification of local tumor invasion and assessment for local/distant metastatic disease). Can Texture Analysis Be Used to Distinguish Benign From Malignant Adrenal Nodules on Unenhanced CT, Contrast-Enhanced CT, or In- Phase and Opposed-Phase MRI? For example, first-order texture analysis can determine how many pixels have attenuation of 0 HU within an adrenal nodule. Second-order texture analysis can determine whether those pixels with an attenuation of 0 HU within an adrenal nodule are distributed evenly or are clustered in groups. Increased tumor heterogeneity is the most likely reason for the ability of texture analysis to predict adrenal malignancy on CECT. As is seen in Figure 2, lipid-poor adenomas appeared homogeneous on CECT, compared with malignant lesions, which appeared heterogeneous. We speculate that the administration of contrast material may make lipid- poor adenomas appear more homogeneous because both lipid-rich and lipid-poor areas will have uptake of contrast medium. Another limitation of the present study is the retrospective nature of the data acquisition. Because this is an observational study, the type of scanner used for each patient was not controlled. One cannot underestimate the potential impact of variation in CT and MR image quality on the results of texture analysis. This factor alone represents a major challenge when one considers the robustness of applying texture analysis in the clinical setting. OBJECTIVE. Diagnostic imaging has traditionally relied on a limited set of qualitative imaging characteristics for the diagnosis and management of lung cancer. Radiomics—the extraction and analysis of quantitative features from imaging—can identify additional imaging characteristics that cannot be seen by the eye. These features can potentially be used to diagnose cancer, identify mutations, and predict prognosis in an accurate and noninvasive fash- ion. This article provides insights about trends in radiomics of lung cancer and challenges to widespread adoption. CONCLUSION. Radiomic studies are currently limited to a small number of cancer types. Its application across various centers are nonstandardized, leading to difficulties in comparing and generalizing results. The tools available to apply radiomics are specialized and limited in scope, blunting widespread use and clinical integration in the general population. Increasing the number of multicenter studies and consortiums and inclusion of radiomics in resident training will bring more attention and clarity to the growing field of radiomics. OBJECTIVE. Diagnostic imaging has traditionally relied on a limited set of qualitative imaging characteristics for the diagnosis and management of lung cancer. Radiomics—the extraction and analysis of quantitative features from imaging—can identify additional imaging characteristics that cannot be seen by the eye. These features can potentially be used to diagnose cancer, identify mutations, and predict prognosis in an accurate and noninvasive fashion. This article provides insights about trends in radiomics of lung cancer and challenges to widespread adoption. Radiomics is defined as the quantification of the phenotypic features of a lesion from medical imaging (i.e., CT, PET, MRI, ultrasound). These features include lesion shape, volume, texture, attenuation, and many more that are not readily apparent or are too numerous for an individual radiologist to assess visually or qualitatively. In other words, radiomics is the process of creating a set of organized data based on the physical properties of an object of interest. Regardless of lesion histology and location, the workflow in radiomics remains similar. Images of the lesion, typically CT images, are acquired. The images are segmented to define the outer limits of a given lesion. Specific phenotypic features are then selected, extracted from the images, and recorded. Finally, data analysis is performed on the recorded data. 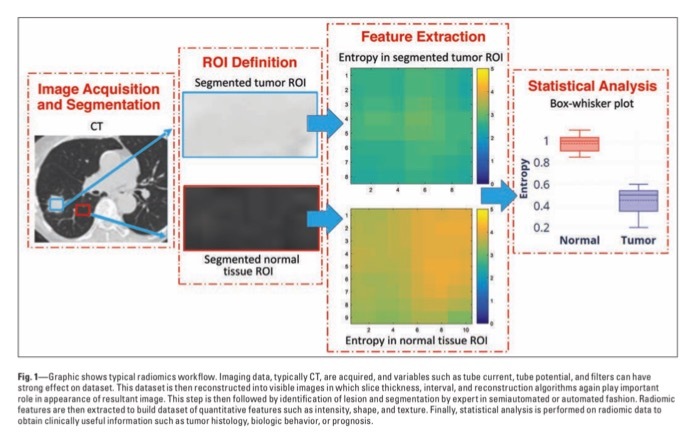 Image features can be extracted and analyzed in either 2D or 3D: 2D refers to segmentation and analysis of radiomic metrics on a single-slice image, whereas 3D refers to the same process across the entire volume of a tumor (many slices). Image features can be extracted and analyzed in either 2D or 3D: 2D refers to segmentation and analysis of radiomic metrics on a single-slice image, whereas 3D refers to the same process across the entire volume of a tumor (many slices). Therefore, 3D radiomics, by definition, requires analysis of the entire volume of tumor. In general, feature extraction and analysis are easier and faster in 2D than in 3D, but 3D may theoretically carry more information. 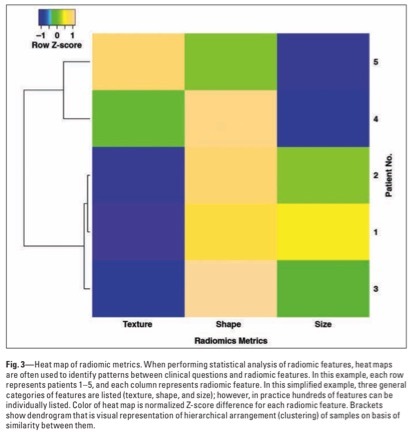 Two-dimensional radiomics is used more commonly, but 3D radiomics is appealing with regard to analyzing intratumoral heterogeneity in cases in which different parts of a tumor may exhibit differing histologic subtypes. Lesion segmentation can be done either manually or in an automated fashion. Manual segmentation—that is, segmentation performed by a trained observer who manually outlines the lesion of interest—is time-consuming and is more prone to interobserver variability and subjectivity than semiautomated and fully automated segmentation. Manual segmentation is important when accuracy of the tumor outline (i.e., lesion shape and size) is needed. Shape is one of the feature categories understood as both semantic and agnostic. It is a category of features that includes diameter measurements (e.g., minimum, maximum) and their derivatives including volume, ratio of diameters, surface-to-volume ratio, and compactness. Diameter measurements and their derivatives are among the most commonly assessed features. Semantic descriptions such as round, oval, and spiculated are understood agnostically by a varied lexicon that attempts to determine how irregular the object is. In the shape category, tumor volume has shown the most promise in predicting treatment response. Second-order texture metrics encompass hundreds of features derived by evaluating the relationship of adjacent pixels in an ROI or across the entire lesion. These metrics account for both the intensity of a gray-scale value and its location or orientation in the image. CT images are formed from a 3D matrix of data that is used to determine the amount of gray-level color to display for a given image pixel. Texture or heterogeneity refers to analysis of adjacent pixels of gray color to determine the relationship between them; if there are wide variances in the amount of gray color in a given area, then a lesion is considered more heterogeneous or to have a coarse texture. OBJECTIVE. The purpose of this study is to evaluate the potential value of machine learning (ML)–based high-dimensional quantitative CT texture analysis in predicting the mutation status of the gene encoding the protein polybromo-1 (PBRM1) in patients with clear cell renal cell carcinoma (RCC). CONCLUSION. ML-based high-dimensional quantitative CT texture analysis might be a feasible and potential method for predicting PBRM1 mutation status in patients with clear cell RCC. In conclusion, ML-based high-dimensional QCT TA is a feasible and potential method for predicting PBRM1 mutation status in patients with clear cell RCC. Nonetheless, more studies with more labeled data are absolutely required for further validation and improve- ment of the method for clinical use. We hope that the present study will provide the basis for new research. How Can Radiomics Be Consistently Applied across Imagers and Institutions? It allows for correction of radiomic measurements on the basis of their distribution and knowledge of covariates. The authors tested their method with one publicly available phantom data set and two patient data sets from patients with lung cancer. They convincingly showed that their method reduced im- ager-induced variability without sacrificing diagnostic sensitivity. Their article explains the method clearly and pro- vides all the references needed to replicate the work. This should encourage others to apply this method and test it in other radiomics studies and applications. OBJECTIVE. The purpose of this study is to evaluate the potential value of machine learning (ML)–based high-dimensional quantitative CT texture analysis in predicting the mutation status of the gene encoding the protein polybromo-1 (PBRM1) in patients with clear cell renal cell carcinoma (RCC). CONCLUSION. ML-based high-dimensional quantitative CT texture analysis might be a feasible and potential method for predicting PBRM1 mutation status in patients with clear cell RCC. OBJECTIVE. The purpose of this article is to describe useful imaging features for differentiating angiomyolipoma (AML) subtypes from renal cell carcinoma subtypes. CONCLUSION. A newer radiologic classification of renal AML consists of fat-rich AML (≤ –10 HU), fat-poor AML (> –10 HU; tumor-to-spleen ratio < 0.71; signal intensity index, > 16.5%), and fat-invisible AML (> –10 HU; tumor-to-spleen ratio, > 0.71; signal intensity index, < 16.5%). Each subtype must be differentiated from the renal cell carcinoma subtype because of overlapping imaging features. CT or MRI features can provide clues for differentiating fat-rich AML from fat-con- taining RCC and fat-poor AML from clear cell RCC. Fat-invisible AML, however, is difficult to differentiate from non–clear cell RCC on the basis of CT or MRI features. Radiologists should not be reluctant to perform biopsy when lesion differentiation is not clear at CT or MRI. PURPOSE: This study is designed to test the authors’ hypothesis that radiologists’ reports from multiple imaging centers performing a lumbar MRI examination on the same patient over a short period of time will have (1) marked variability in interpretive findings and (2) a broad range of interpretive errors. STUDY DESIGN: This is a prospective observational study comparing the interpretive findings reported for one patient scanned at 10 different MRI centers over a period of 3 weeks to each other and to reference MRI examinations performed immediately preceding and following the 10 MRI examinations. PATIENT SAMPLE: The sample is a 63-year-old woman with a history of low back pain and right L5 radicular symptoms. RESULTS: Across all 10 study examinations, there were 49 distinct findings reported related to the presence of a distinct pathology at a specific motion segment. Zero interpretive findings were reported in all 10 study examinations and only one finding was reported in nine out of 10 study examinations. Of the interpretive findings, 32.7% appeared only once across all 10 of the study examinations’ reports. 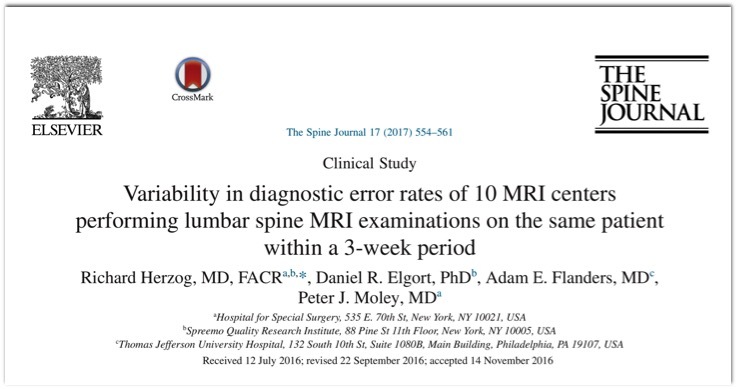 CONCLUSIONS: This study found marked variability in the reported interpretive findings and a high prevalence of interpretive errors in radiologists’ reports of an MRI examination of the lumbar spine performed on the same patient at 10 different MRI centers over a short time period. As a result, the authors conclude that where a patient obtains his or her MRI examination and which radiologist in- terprets the examination may have a direct impact on radiological diagnosis, subsequent choice of treatment, and clinical outcome. Background: Identification of incidental pancreatic lesions is increasing because of advancements in imaging. Diagnosis remains a challenge for clinicians, with intrapancreatic accessory spleens (IPAS) posing a unique dilemma. IPAS are frequently resected because of inability to exclude alternate diagnoses, subjecting patients to unnecessary risk. The purpose of this study was to examine our institutional experience with IPAS and develop a multidisciplinary algorithm to improve preoperative diagnosis. Conclusions: Incidental pancreatic lesions like IPAS remain a diagnostic challenge for clinicians. Employing a diagnostic algorithm as proposed may aid in the distinction of malignant and premalignant pathology and prevent unwarranted pancreatic resections. On CT, IPAS appears as solid heteroge- neously enhancing masses, size averages 1-3 cm, and most commonly within 3 cm of the tail of the pancreas. Similarly, 90% of our patients had an enhancing distal mass with a mean maximum diameter less than 3 cm. The attenuation of accessory splenic tissue is similar to the spleen on arterial and venous phases, which was commented on in only two of the initial CT reports. High-Value Multidetector CT Angiography of the Superior Mesenteric Artery: What Emergency Medicine Physicians and Interventional Radiologists Need to Know. Ghodasara N, Liddell R, Fishman EK, Johnson PT. Segmental arterial mediolysis is a nonatherosclerotic and noninflammatory arteriopathy characterized by lysis of the smooth muscle of the outer media that results in dissecting aneurysms and intramural hematomas. Unlike those of most vasculitis's, inflammatory or immune markers are most often normal. Middle-aged and elderly patients are affected most commonly and can present with abdominal pain, distention, decreased hemoglobin level, bowel ischemia, or shock. Imaging findings of segmental arterial mediolysis are similar to those of other vasculitis's, although it classically results in alternating aneurysm and stenosis of the abdominal splanchnic arteries, without involvement of other vessels. Colonic diverticulosis and angiodysplasia can be differentiated readily at multidetector CT, which is of prognostic importance, because bleeding recurs in up to 85% of untreated patients with angiodysplasia, while only 25% of untreated diverticular patients experience recurrent bleeding. Angela D. Levy et al. “Vascular diseases that acutely compromise the SMA and threaten its tributaries include occlusion, dissection, aneurysm rupture, pseudoaneurysm, vasculitis, and SMA branch hemorrhage into the bowel. Clinical evaluation and imaging are both essential to determine whether a patient should be treated conservatively or requires a surgical or interventional procedure." Within the mesenteric root, the SMA branches into approximately four to six jejunal and nine to 13 ileal arteries arising on the left side. The right-sided branches include the middle colic, right colic, and ileocolic arteries . The branching pattern of the colonic arteries often varies, although the middle colic artery commonly arises from the proximal SMA, and the ileocolic artery represents the terminal branch. The SMA provides blood supply from the ampullary region of the second portion of the duodenum to the distal transverse colon near the splenic flexure." 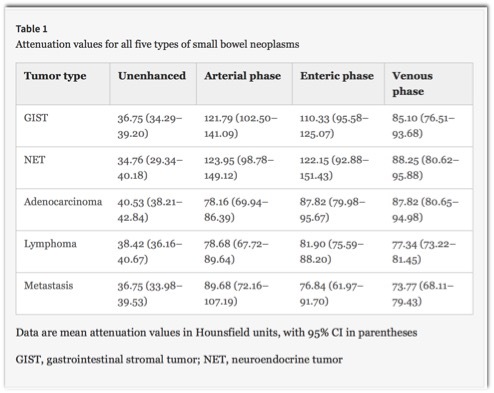 Multimodality imaging of small bowel neoplasms. - Tumors can be very large and markedly exophytic, with a heterogeneous appearance on CT and MR because of hemorrhage and necrosis. ”Malignant GISTs can present with metastases to the liver, omentum, and peritoneum. Lymphatic spread and retraction of the mesentery are unusual features compared to other malignancies affecting the small bowel. Recurrent disease following surgical resection is not uncommon in the setting of malignant GIST”. ” Malignant GISTs can present with metastases to the liver, omentum, and peritoneum. Lymphatic spread and retraction of the mesentery are unusual features compared to other malignancies affecting the small bowel. Recurrent disease following surgical resection is not uncommon in the setting of malignant GIST ”. Comput Assist Tomogr. 2017 May/Jun;41(3):407-411. Jin Sil Kim et al. - Most common mesenchymal tumor of the gastrointestinal tract. Scola D, Bahoura L, Copelan A. et al. Vasconcelos, R.N., Dolan, S.G., Barlow, J.M. et al. 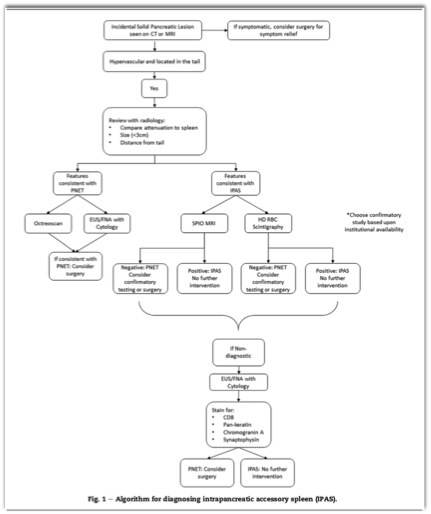 Pancreatic Incidentalomas: A Management Algorithm for Identifying Ectopic Spleens Baugh KA et al. Segmental arterial mediolysis is a nonatherosclerotic and noninflammatory arteriopathy characterized by lysis of the smooth muscle of the outer media that results in dissecting aneurysms and intramural hematomas. Unlike those of most vasculitides, inflammatory or immune markers are most often normal. Middle-aged and elderly patients are affected most commonly and can present with abdominal pain, distention, decreased hemoglobin level, bowel ischemia, or shock. Imaging findings of segmental arterial mediolysis are similar to those of other vasculitides, although it classically results in alternating aneurysm and stenosis of the abdominal splanchnic arteries, without involvement of other vessels.